Beat shortening and butter until smooth. Add the brown sugar and white sugar, along with the baking soda, and again beat until thoroughly mixed. Beat in the eggs and vanilla. Then slowly beat in the flour. 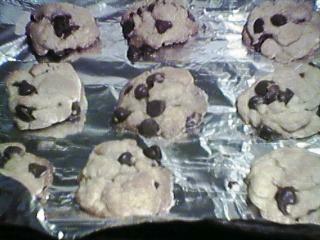 Add chocolate chips and refrigerate the mixture for 1 hour. Drop rounded teaspoons 2 inches apart on ungreased cookie sheets. Bake at 375º F for 8-10 minutes, or until browned. Cool on a wire rack.